Just try to tell me this isn't a Ghost Busters rip-off. But, just like Spooky Family immediately abandoned its initial purpose of ripping off the Addams Family, Ghost for Sales quickly veers off into a goofy, all-over-the-map Hong Kong movie. The result is part low-budget Ghost Busters parody, part wirework flying kung fu historical piece, part "sleazy corporate world versus honest fellow" feel-good movie, part Three Stooges buddy movie, part relationship movie, ... and the list goes on. He played too much of this as a kid. His theme park is doing fine ("fine" here means "not haunted"). But for some reason he decides he needs to install two dangerously haunted thousand-year-old corpses on the grounds of the park. You can probably guess where this is heading. 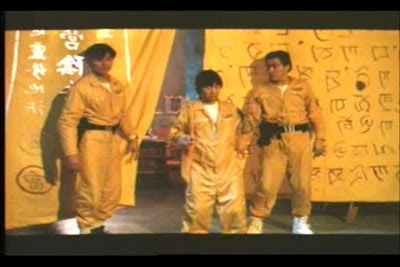 Meanwhile Ricky Hui and the rest of the Ghost for Sales crew have been goofing around exterminating ghosts and pulling nonsensical pranks in a haunted brothel. Somehow they wander onto the amusement park grounds with special "ghost wave finding" hand held GPS machines. These machines are used to measure exactly the place you should never ever put haunted corpses. 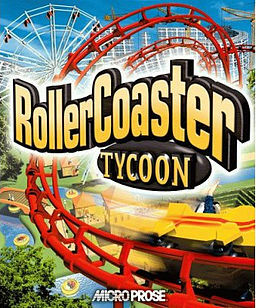 And, yes, it turns out that the location the Roller Coaster Tycoon has in mind for his corpses is coincidentally the very worst place to put corpses in all of Hong Kong. 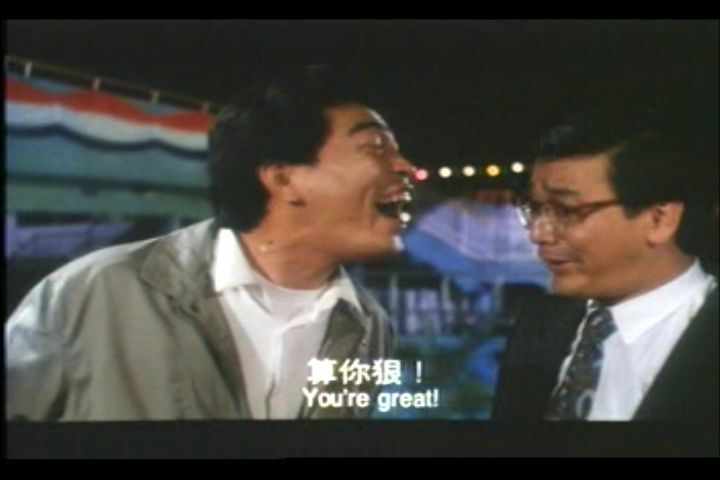 There are a ton of continuity problems in this movie that really only make it more fun to watch from the Gweilo's perspective. 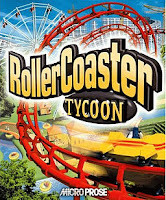 There's an old window washer who gets fired by the Roller Coaster Tycoon, then turns into a ghost, and then dies. (Yes, in that order.) There's scenes of trucks and police cars driving around that are entirely unconnected to the plot at all. You mean like William Burroughs? Really? Really? This juvenile, unsung act of rebellion on the part of this movie's lowly, underpaid subtitle translator makes Ghost for Sales golden by any standards! If I ever meet the disgruntled employee who translated the conversation this way, I will happily buy that man a beer. This guy is my new hero. And then there are the fight scenes, which are well executed but full of WTF moments. I like how this monk tries "Abracadabra!" as a magic spell to banish this ghost. And I like how it doesn't work. 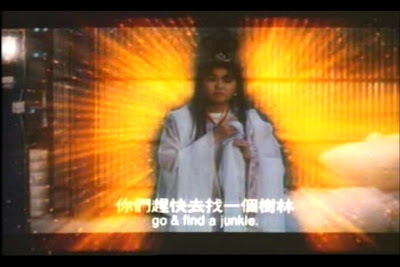 And I like how they play around mixing Taoist ghost busting techniques from Hong Kong movies with the weird mechanical inventions of Ghost Busters. 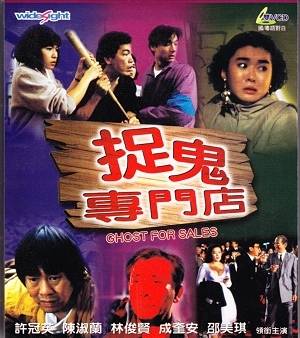 Bottom Line of this Chinese Movie Review: Ghost for Sales is a real delight from the Gweilo's perspective. Recommended! hey Eric.. this is a very good post of yours.. nice blog you have here, very interesting.. will add you up to keep updated with HK movies.. at least now I have somewhere to refer to cos I am sort of "banana"... dont know how to read mandarin.. thanks for coming by.. Sad to think Ricky Hui has passed on...suddenly.. This is fairly new... 10 years ago... Oh well not that new. It's funny and cheesy. It was just refreshing to see that in '98 when almost all of Asian horror went super serious. Thanks for coming by, and for your kind words about the site. Yes, it's sad and sudden. 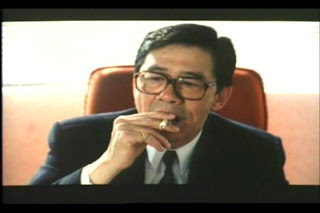 Alan Tang, Kim Tai Chung and now Ricky Hui have all died this year. Thanks for the visit, and the translations! 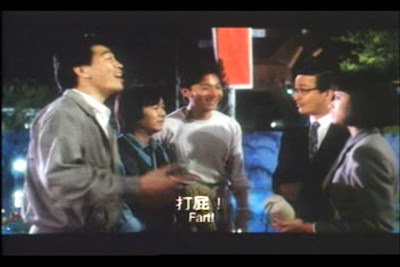 If they are saying "fart", that just makes the movie even weirder, in a good way of course. And "go find a forest" would make a little more sense than "go find a junkie"--I think she wants them to find the exact, precise spot that the ghosts died. So go find a forest does make sense. Except it's a hilarious way to give precise directions. Thanks also for the recommendation! I'll have to give Bio Zombie a try. From what I've seen, zombie movies are few and far between from Hong Kong. 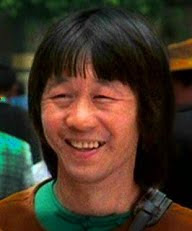 There is a Chinese comedy zombie movie I had seen .. But .. I don't remember the name .. The story is about two masters sending their students and a kid for a zombie hunt .. But they fart on their faces ;) hahaha at the end the aake their masters to close their eyes and to breathe in and fart and run away .. Please tell me the name of this movie !